I love to travel, and I love to fly. I think it is important as the Archdruid of ADF that I get out and talk to people face-to-face. As we all know, a lot is missed with virtual communication. I believe people want to see their leaders, not just hear about them. 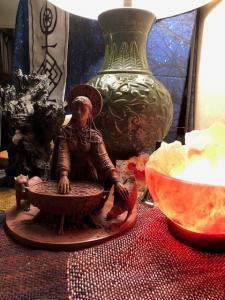 I was doing just this when I discovered the Urban Earth Mother. It is inevitable, especially with the uncertainty of air travel, that one gets delayed. This seems to happen more and more these days and it happened to me at ORD. As opposed to sitting in a crowded area with lots of talking and announcement, I went in search of some peace and solace. I found it! My search brought me to a small rotunda between several concourses. At the end of Concourse G in Terminal 3, there is a small rotunda and I decided to go up the stairs to see what I could find. 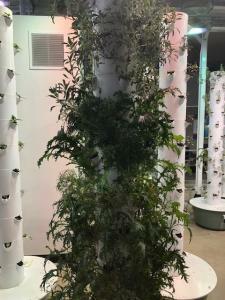 As I reached the top of the stairs, I passed a USO club, a Mother’s Room, and then an indoor garden and its accompanying spirit that I call the Urban Earth Mother. 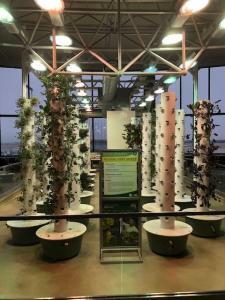 The Chicago Department of Aviation (CDA) has been busy working on Sustainability. As part of this sustainability, the CDA has installed vegetated roofs, 232,534 square feet of them to be exact, at both Chicago O’Hare and Midway airports. Vegetated roofs help reduce the heat island effect, lower operating costs, double the life cycle of roofs, increase storm water retention, reduce air emission impacts, and reduce noise. In 2013, the CDA installed an apiary at ORD with a total of 33 beehives. These beehives house approximately 1.3 million bees and is the largest apiary at any airport in the world. I can only imagine that Hannahannas, Earth Mother of the Hittites who has a bee as a messenger, would be impressed. 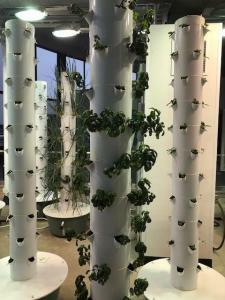 When I walked up the stairs, I was impressed to see something I have never seen before: an Urban Tower Garden. This is where I found this Urban Earth Mother living today. Growl lights illuminate the garden. Nearby windows are very large and stretch about 10 meters in height and 40 meters in breadth. 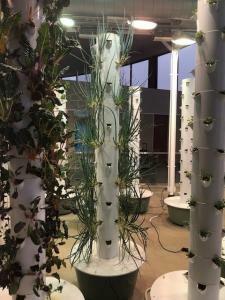 There are 24 columns that are located below the grow lights and they have multiple, alternating opening in which plants are growing. These plants include Swiss chard, sweet basil, scallions, cabbage, and sage, to name a few. 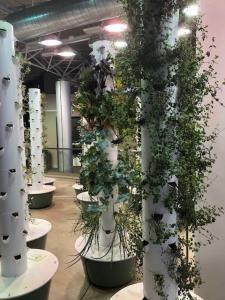 These columns have hose links for watering purposes and the plants do reach skywards towards the (grow) light. With all the noise that one may find at an airport, it is relatively serene around this garden. Near the back of the garden, close to the windows, new plants are growing. They begin their lives here, in these trays. This is their nursery, where they grow from seedling to plant. Therefore, once they reach a certain height, they are placed into the pillars. 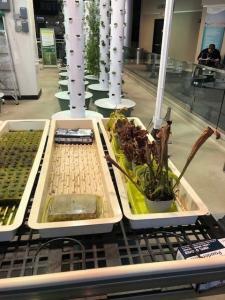 These plants get a combination of grow lights and of natural light from the large windows. They reach upwards towards the grow lights, perhaps because that bright light is more intense than the light from outside. It is the presence of life in an environment where typically it would not be possible. I experienced a different kind of Earth Mother. In this instance, it is human and nature working together to make an oasis in this urban environment. Through the combination of the two, a place to honour the Earth Mother emerges. It is not the classic temple: there is no open sky over head, nor are there trees nearby. It is not a forest, nor a glen, nor valley. Here technology and green combine into a new matrix. I call this the Urban Earth Mother. I closed my eyes, and I felt her around me, serene in the silence of this urban temple.